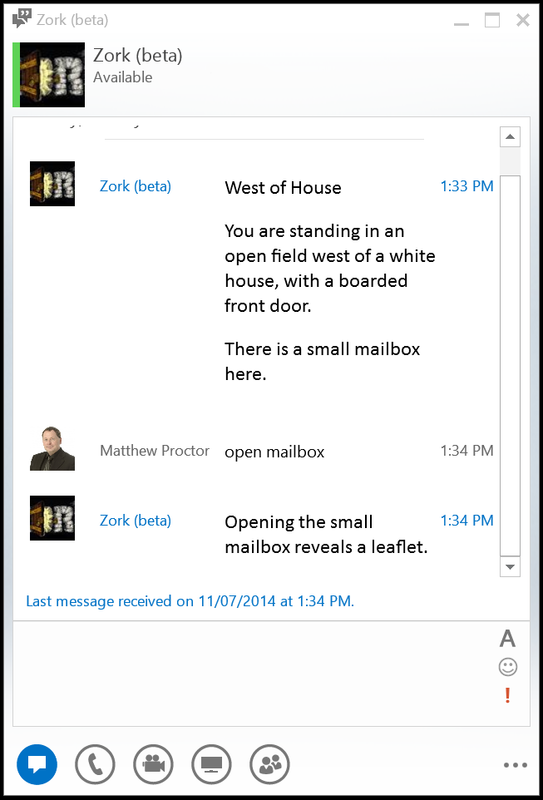 Ok, maybe not only Zork for Lync specifically, but a Z-Machine interpreter for Microsoft's Lync platform. Back in the 1970s, Joel Berez and Mark Blanc created the Z-Machine, the virtual machine used by games company Infocom to deliver its text adventure games, such as Zork, Planetfall and the Hitchhikers Guide to the Galaxy. Creating a Z-Machine interpreter is not a simple task, however the standard is well documented, and many people have accomplished this in the past. 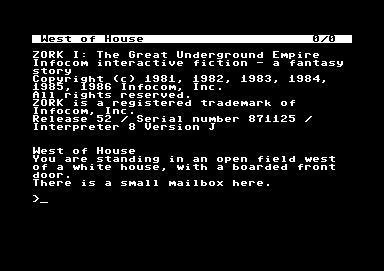 For the purposes of simplicity, and to allow my interpreter to utilize a large catalogue of games, I'll be working with the .z5 format, and testing using games compiled by Infocom in the 1990s using Zilch. l0010:         print_ret "That's difficult unless your eyes are prehensile." 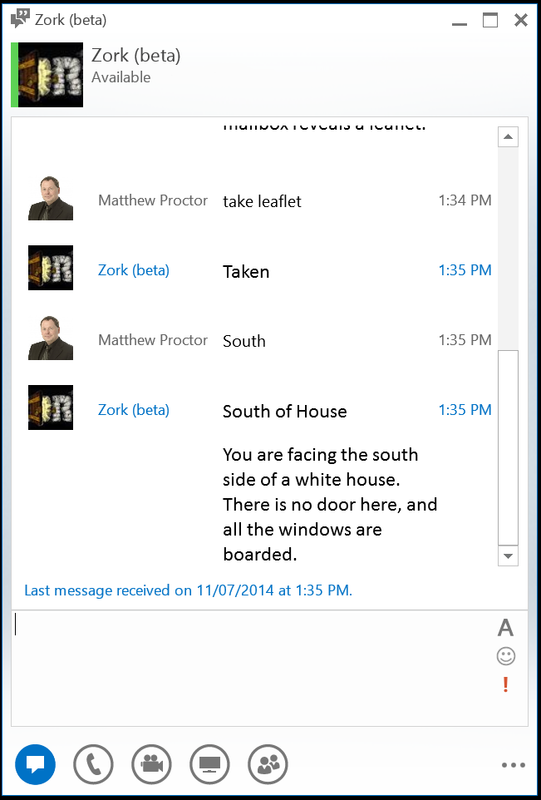 Traditionally, Z-Machine interpreters utilize simple text-based consoles for interacting with the player. This can be via a Java or html5 app, an iOS app, or other desktop applications for a variety of operating systems. Microsoft has made available a number of APIs for Lync, and I have chosen UCWA (Unified Communication Web API) as the means to communicate with the Lync client. Interested in helping test this app? Contact me via email or on Lync, and I'll send you details on how to connect to the Interpreter. Once it's a little more stable, I'll publish details of it here for people to play. 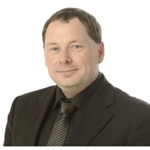 I am an Australian IT professional based in Melbourne, Victoria, Australia.